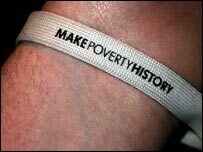 Cornwall's Eden Project wore a white band on Saturday as part of the Make Poverty History campaign. A giant version of the anti-poverty pledge bracelet was wrapped around Eden's humid tropics biome. The movement, coordinated by Oxfam, is now the UK's biggest ever anti-poverty alliance of more than 450 groups. The organisations include charities, campaigning groups, faith communities and celebrities. The Eden band will be supported by Eden Chief Executive Tim Smit, Truro Bishop the Right Reverend Bill Ind, actor Tony Robinson, and MP Colin Breed. The Make Poverty History campaign calls for urgent action on fair trade justice, debt cancellation and better aid for developing countries.